If you’ve been to a few kids’ birthday parties or more than a handful of bake sales in the past several years – or longer, as I remember first trying this in the 90s – you’ve probably seen cupcakes baked in ice cream cones. This is a really cute way to serve cupcakes, turning them into ice cream cone look-a-likes that are always a hit wherever they’re served. To make them, you usually try to prop up the ice cream cones into a traditional muffin tin and treat them as a kind of edible cupcake wrapper. This method can be pretty tricky – as anyone who has tried it can tell you – because it is very easy to tip those cones over and make a mess (or, at least, uneven cupcakes) before they’ve fully baked. 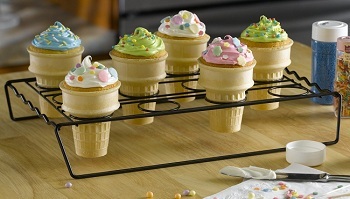 Nifty’s Ice Cream Cone Cupcake Baking Rack is designed to streamline this process and make it a whole lot easier to bake cupcakes in ice cream cones. The oven-safe, non-stick rack holds up a dozen ice cream cones during baking, so you don’t have to worry about tipping them over as you adjust the pan or them falling thanks to having an uneven base. The rack isn’t going to get as much use as a standard muffin pan, of course, but these ice cream cupcakes get such a hugely positive reception at parties and get-togethers that having a rack like this will definitely have you baking them a lot more often! This is so cute and the kids just loves this. 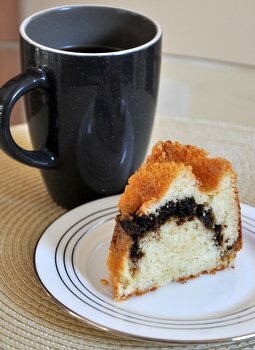 It might be a bit tricky to make but it’s definitely worth it.